The statement was made in a loyalist magazine which is associated with the UDA in south Belfast. “The UDA are still in existence and won’t be leaving any stage whilst Republicans of any faction still exist,” it declared. The British government has also refused to acknowledge the statement. And after attempting to play down the levels of UDA violence following a double bombing in the County Antrim village of Ahoghill, there was a great reluctance by the police to identify those behind a sectarian bomb attack on a home in Derry which has been blamed locally on the UDA. 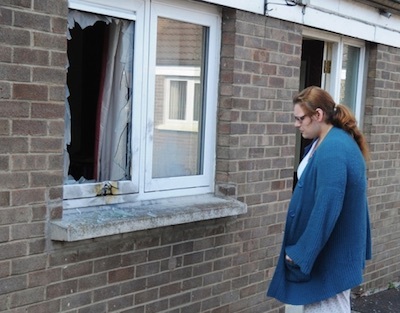 Rachael Keys has described how she narrowly escaped injury when the device ripped into her house in Lincoln Court in Derry’s Waterside last Saturday night. She described seeing a “big flash and loads and loads of smoke” when the bomb detonated. “I was sitting in the house, in the living-room, and the next thing the whole lot came in round me,” she said. The woman moved into the house 10 months ago but said the PSNI had warned her it would not be safe for her to return. “You just, sort of, get used to people putting you out of places, they obviously just don’t want you here,” she said. Last month, the DUP withdrew its Ministers from the Six-County powersharing Executive in response to allegations that the Provisional IRA continues to exist. Declaring it could not be “business as usual”, DUP leader Peter Robinson announced a tactic or reappointing Ministers who would then offer their resignations. This week it emerged that these Ministers are still receiving their executive salaries, despite a party promise this would not happen, and still using their ministerial cars. On Tuesday, Sinn Fein responded to the loyalist statement by asking unionist leaders where their outrage was. South Down representative Chris Hazzard said their silence was “in deafening contrast” to their reaction to claims regarding the Provisional IRA. The continued activities of the UDA are being almost entirely ignored by the political establishment and the mainstream media in Britain and Ireland. Drug-dealing and other forms of criminality have grown, but still interspersed with bouts of sectarian violence and inter-factional feuding. Recruitment posters have appeared in several areas. “This is the same UDA whose political wing unionism stood shoulder to shoulder with, in an effort to force an Orange march through a nationalist community,” Mr Hazzard said. “Perhaps that’s why there are no statements or social media posts from the DUP or UUP on the UDA’s continued existence. Meanwhile, the crisis talks at Stormont, ostensibly intended to deal with paramilitarism, are continuing British Prime Minister David Cameron said he believes there is a will among the politicians to solve the problems. He added: “You can’t have politicians that are holding a ballot box in one hand and a gun in the other, in any shape or form,” he said. The comment is understood to have been directed at Sinn Fein, rather than the unionist parties. Despite the offensive slur, the statement has been interpreted as a sign of progress. Sinn Fein’s Martin McGuinness told a meeting of his party on Wednesday that the political talks will be successful “against the odds”. He said the devolved institutions “are worth saving and I believe the vast majority of people share that view”. But he said the parties must agree to protect the most vulnerable and ensure Stormont has “a workable budget so that public services are delivered to the standard that the public expect and deserve”.